I had a good one last season but this one is a bit slower... rolls on items not ideal in some cases. I did get some ancient weapons handed me last night... not ideal rolls in some cases but not too shabby. My first ancient was one of my first legendaries. The Justice Lantern on my Demon Hunter I tweeted about. So annoying. Doing better with DH than I usually do in a season, though I expect my gear is far from perfect. Did clear GR40 last night, but Torment X is tricky, taking damage from most things kills so quickly. Also found the other big problem of playing a Dex character instead of my usual Str. Can't palm off as much useful gear on my Templar. Yeah, the "Diablo 3 is dead" posts were strong when people began noticing that. I didn't care... I play Diablo and don't want to buy another franchise's product to get Diablo content. I hope the new Diablo projects includes a new Diablo 3 expansion. There's so much that still needs to be perfected. If I had a Switch I would probably pick it up... but I don't. I'm sure one of the other projects will end up being Diablo 4, just a question of when it'll come out. 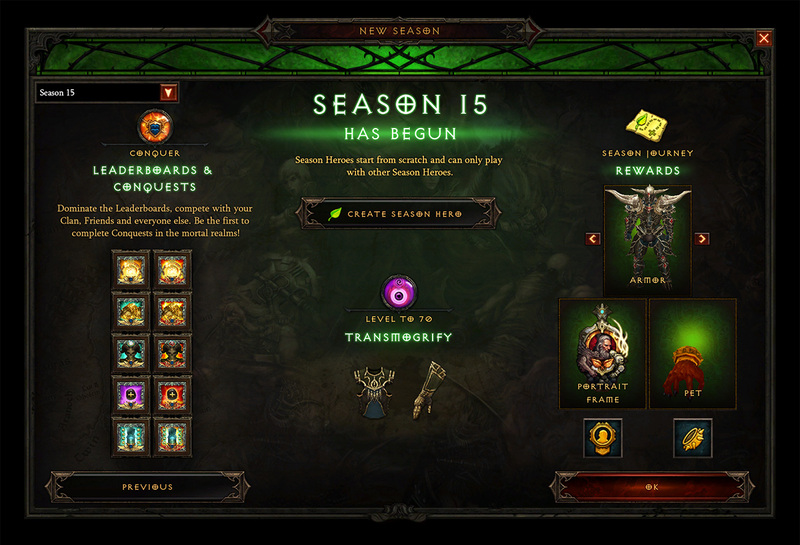 With them starting to do themed seasons for D3 it's probably not very soon. But I'm guessing we might hear more come BlizzCon? - if they really wanted to milk players a bit more, only give them adventure mode, challenge rifts and Act 1 and make them pay for Acts 2-5 of the campaign. The Crusader and Necro would then be purchasable packs with the Crusader combined with the digital deluxe content to make it somewhat substantial. I'd say that anyone who has the base game will get the RoS content for free like they gave anyone with WoL a free upgrade to HotS. Just my thoughts. D3 is old now. They need to make it enticing for new players to try, they need to keep the player base interested in continuing to play the game, and they need to make more money whilst doing this. Making it F2P removes the barrier to entry and setting the shop front up makes deploying new content so much easier. And because they've done it for SC2, they can't be accused of simply following in PoE's footsteps. That's not Blizzard's way anyway. I believe their games will continue to be released as AAA titles if given the choice... but they'll convert to F2P to keep the game going once the game gets a bit old. Oooo, includes the Necro pack as well. I've already done 4 purchases of D3... 3 times on pc (needed the character slots) and one on ps3. Decided to run a bunch of GRs in NS on my SC account to a) burn through some keys and b) level up some gems. Managed to hit GR90 with my IK HOTA Barb and also starting to push with the Invoker Thorns build a bit too. Setting up my Sader gear for end of season... yeah! Season 15 starts September 21 5pm PDT, 22nd 10am Sydney time. New theme is Boon of the Horadrim, which gives double Horadric Caches after completing bounties. Not sure I'll bother this season, got a week to decide! FFS! Double bounty caches... hooray for originality. I'm calling it now, Season 16 will be double xp bonus. I didn't play much of S14 due all the crap in real life I've been dealing with... I pretty much just did up to chapter 4 to get my cosmetics and free set on the starter weekend (when there's a bit of clan activity) so that I'd be in a decent position to continue if I wanted to play... probably a good strategy for anyone iffy on how much time they want to sink into this season. Curious to see how quickly they get S16 up after S15 ends considering xmas is less than 2 weeks after S15 ends. Look to be the ones to do unless you like doing the campaign in under 1hr or master 8 set dungeons. I'll likely go WIzard on both accounts... need my Meteor Wiz gear. Pulled off that custerian wristguard trick this season! And after all these years and playing 11 out of the previous 14 seasons, I've still managed to find a build that I haven't tried yet. Currently got a pseudo flashfire build going with the Tal Rasha set (best set for Wizards IMHO). I wasn't dropping any multipliers and then a wand of woh dropped, followed by an In geom and then Orb of Infinite Depth. It's as if the game was telling me to run flashfire. Needed some DR so went hunting for a karini... and got it too! (well two... one good enough to wear). A Halo of Arlyse might work better but have yet to get one. Got FnR rings this morning... one of the few builds that looks to work well with FnR for the Wizard. I love running into packs and making them blow up... the build is pretty tanky up to T11. 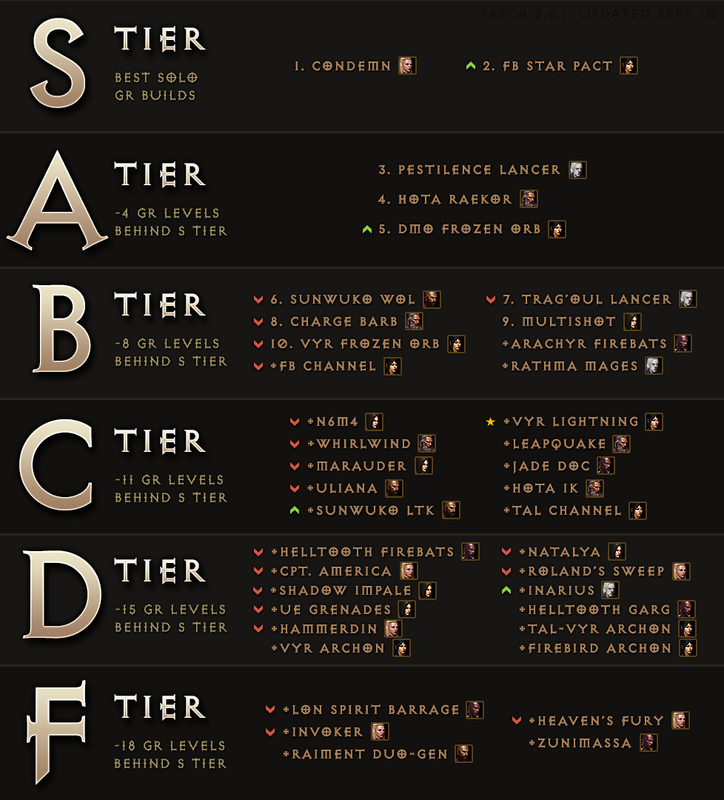 T12 I procced once in a rift when I think all the buffs were down. They really need to buff the Orb of Infinite Depth or Wand of Woh to make the build GR70 viable. This thing caps out at T13 which is a shame. Also managed to get rank 47 for the Avarita conquest too... but that's probably a sign of how dead this season is more than my play time (which isn't all that much compared to past seasons) or skill level.